The recordings were made directly from the Tubular's outputs. No additional effects were used on any of the demo tracks. Some post-processing was done, including normalization, editing out extra silence, and removing pickup noise from the silent areas, to get the recordings ready for release. Only a simple volume adjustment was done on the parts you hear. For the first three, you will hear the un-effected sound followed by effected versions, with increasing Drive setting. It sounds like the volume is increasing because each part was separately normalized to the same peak level (-1.5 dBFS). The "compression" effect produced by distortion adds loudness. In a mix, it gives the guitar more presence. Power chords. As with any distortion effect, Tubular sounds great on simple power chords. This demo uses chords composed of two notes a fourth interval apart. Enhancement of vintage distortion effect. 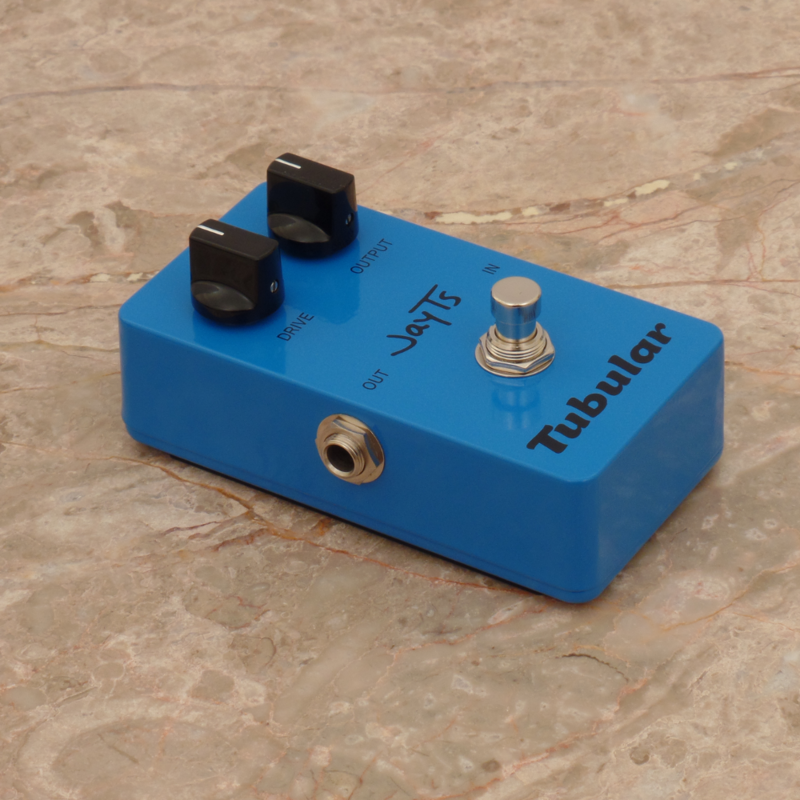 Tubular is used with a low Drive setting to add harmonics without dominating the sound. Higher Drive settings can also be used to produce a harsher distortion if that is desired. Harmonic enhancement is added to electric bass using a low Drive setting. Listen carefully, and you will hear more growl and a deeper sound. For all demos in this section, two Tubulars were used, one for each stereo channel, to preserve the synth's stereo image. Demos 1 through 7 have 5-10 seconds of un-effected signal, followed by about 1/2 to 1 second of silence, then about 30 seconds of effected signal, with the amount of effect (Drive control of the Tubular) gradually turned up into saturation, then turned back down more quickly to fade out. Demo 8 is an example of the Tubular effect used as a modulated effect, in addition to the filter being modulated. Listen for both the filter cutoff modulation and the distortion being modulated. Notice how it's a lot more interesting with two things being modulated, instead of just one. These demos are similar to the synthesizer demos above, but for basic analog waveforms, to show how Tubular can be used with analog synthesizers. Sine Wave. When the effect of Tubular is turned up more, the waveform gradually turns into a square wave. Harmonics are added gradually at first, with the emphasis on even harmonics. By varying the Drive control of the Tubular effect, you can morph a sine wave back and forth between sine and square. Triangle Wave. Tubular adds even harmonics, which don't exist in a perfect triangle or square wave. It adds presence that you normally need to use a square wave for, and allows morphing between a triangle wave to somewhere between a triangle and square wave. Square Wave. When used on a square wave, Tubular adds even harmonics for a smoother sound. Sawtooth Wave. Sawtooth waves are composed of both odd and even harmonics, making them notoriously hard on the ears. The usual method of taming them is to lower the filter cutoff to weaken or remove high-frequency harmonics. 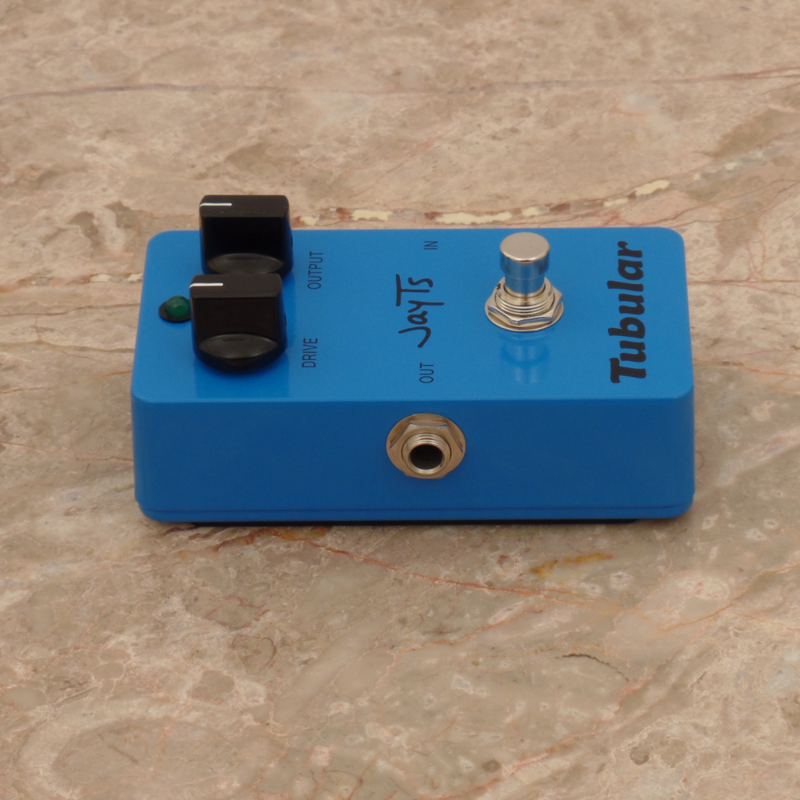 Tubular changes the balance of the harmonics to strengthen even harmonics and make it sound much smoother. This allows you to retain higher harmonics and still get a non-irritating sound. NOTE: Includes 9-volt battery, but no power adapter. 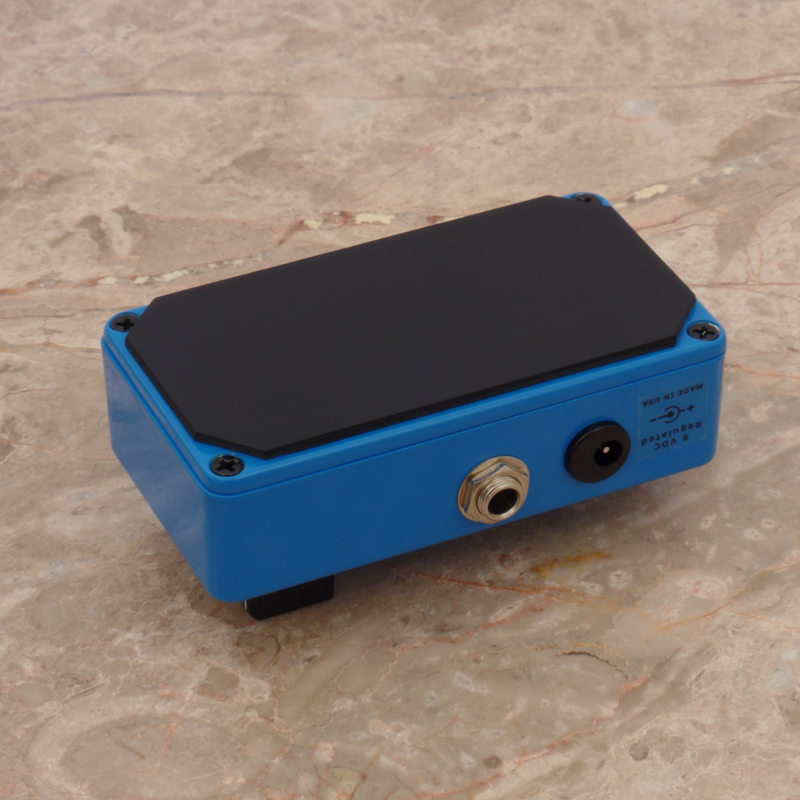 You will need a 9-volt power adapter like those commonly used for effects pedals. Specifically, it needs to provide a regulated 9-volt supply, and have a 5.5/2.1mm center negative connector. If you need help with this part, contact me, and I will send you a list of suggested products. Tubular creates harmonic enhancement and distortion in the same way vacuum tubes do, but without the size, weight, power consumption, expense and unreliability. 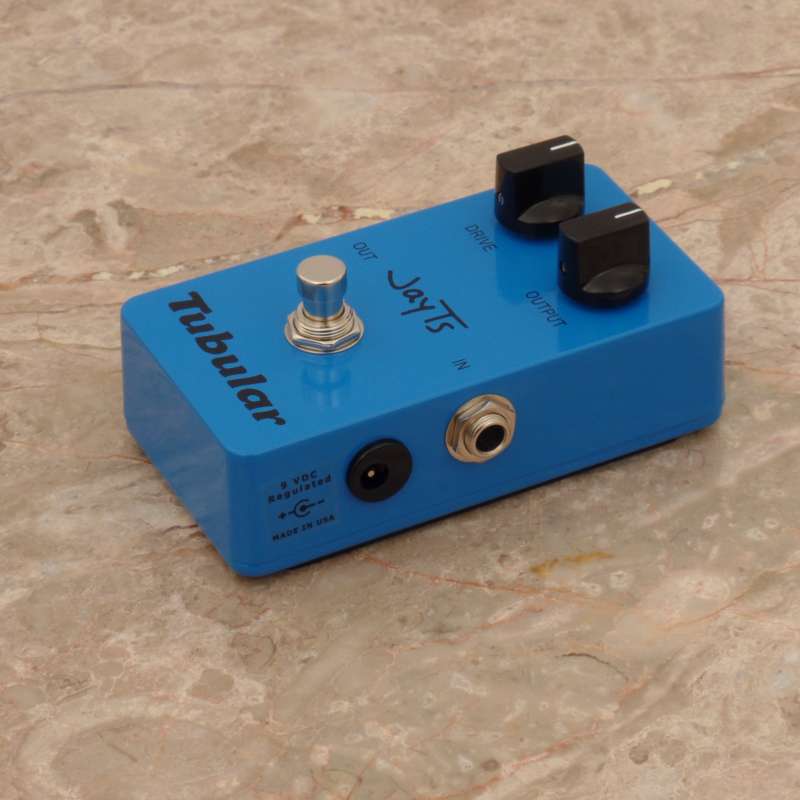 Using two class A FET preamplifier stages, Tubular produces double the effect of a single-stage FET or tube preamp circuit. 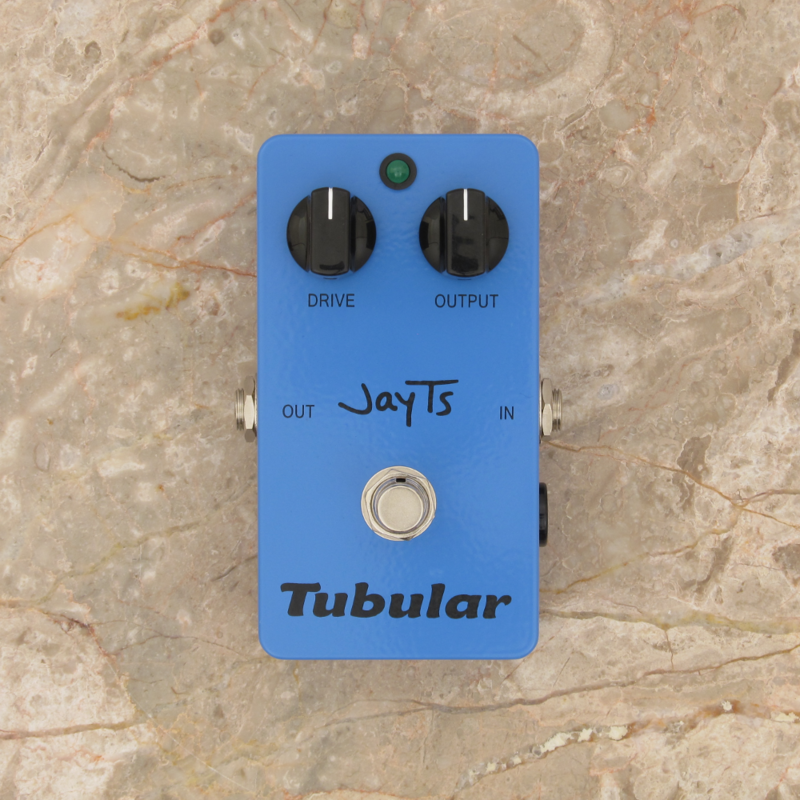 When the drive control of Tubular is set low, a gentle harmonic enhancing effect is produced that can make almost anything sound a little better and more interesting. As the drive is turned up, a thicker effect is produced, turning into a rich clipping distortion as the preamp stages are driven harder and harder. 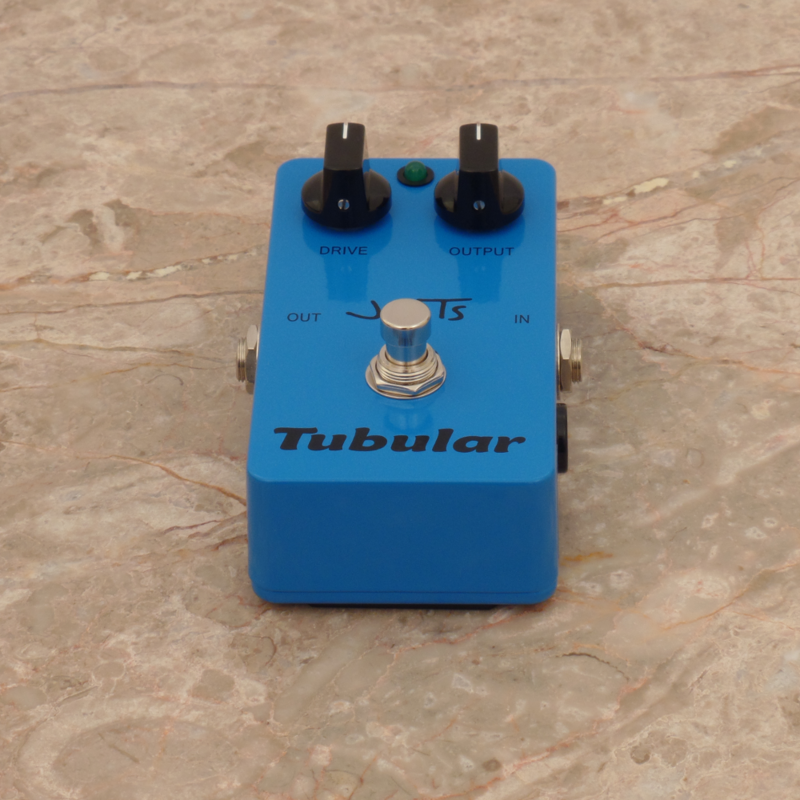 With the drive set high, Tubular creates the kind of wonderfully rich distortion that everyone loves and expects in rock music. 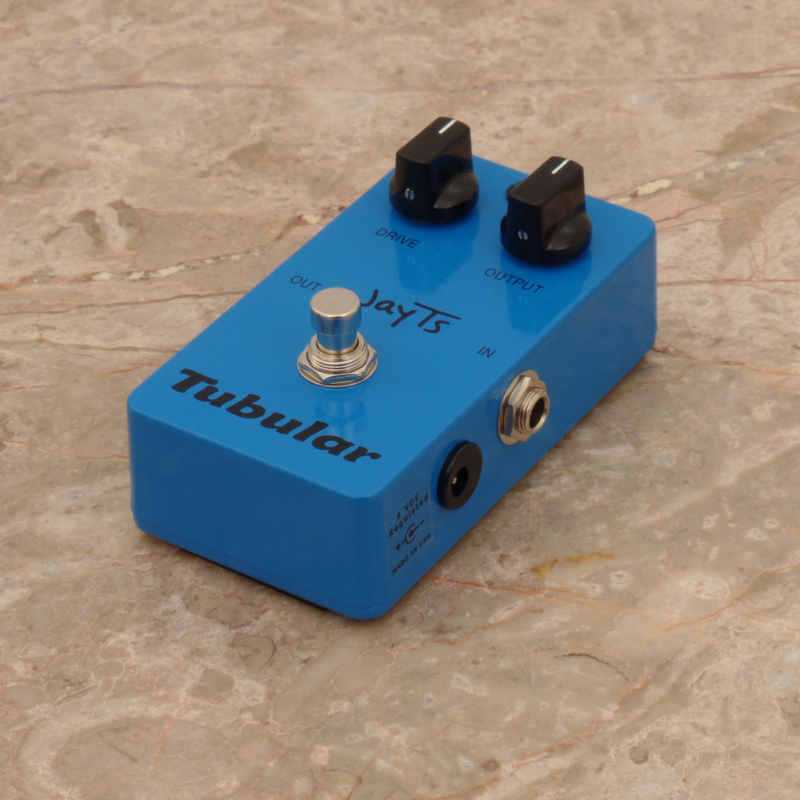 What's special about Tubular's distortion is that it is always rich in even harmonics, without creating annoying high frequency odd harmonics. Tubular's sound is easy to work with and allows more musical possibilities. Simplifies creation of distorted, hard rock guitar sound. Improves the sound of any other effect, including other distortion effects. Adds "growl" to weak, thin-sounding electric basses. Adds presence. Especially effective for a bass with plain- or dull-sounding pickups and/or electronics. Adds distortion effect to vocals or other mic'd sounds. Warms up synthesizers or digital effects to fix overly "sterile" digital sound. Helps to create "vintage" sound, for use on 1930s-1970s styles of music. Getting a great sound from Tubular is simple. The easiest way to start is to turn the Drive control all the way down, and the Output control all the way up. This results in no boost or cut in level while adding a very light (almost subliminal) touch of harmonic enhancement. From this starting point, increase the Drive control and decrease the Output control to keep the output level constant. (Increasing the drive causes the level to go up, so you need to compensate by turning the Output control down.) This process is really easy if you have a level meter in your signal chain. There's a point where you may notice that as you increase the drive, you no longer need to decrease the Output control. 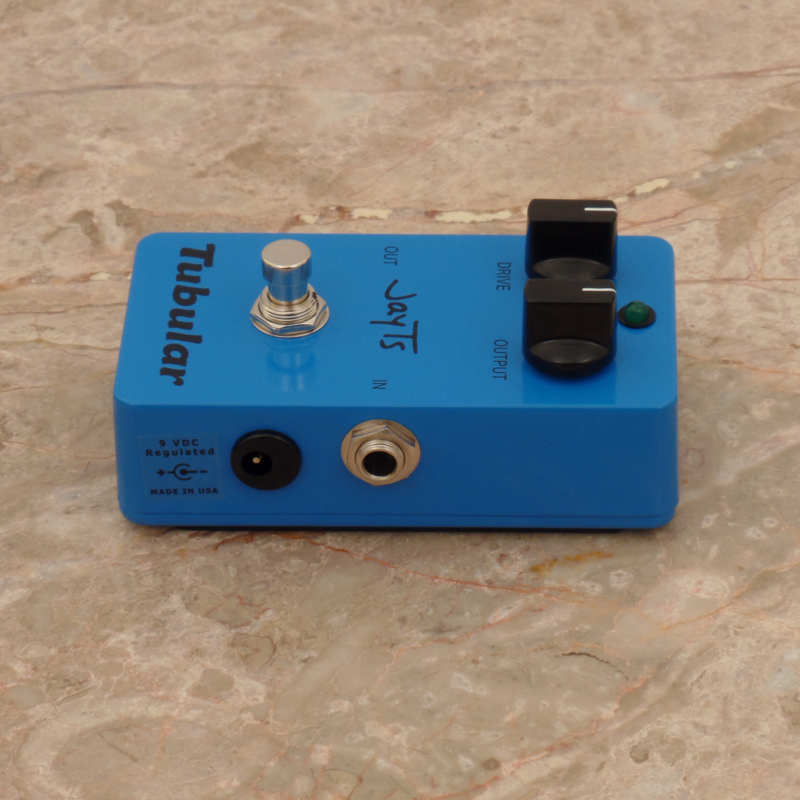 In this range, Tubular is clipping heavily, and increasing the drive simply makes the distortion thicker and rougher. This effect is especially useful for playing power chords. Have fun! True Hardware Bypass. When bypassed, Tubular adds less than 15 picofarads of capacatance, and less than 0.1 ohm of resistance. That's equivalent to about a 1/256" (0.1 mm) length of average guitar cable. High quality circuit design and manufacturing: Designed for touring and recording professionals, or anyone who wants a world-class sound. Made in USA using high-quality parts. To make sure you get top quality at a reasonable price, I get the best prices on parts that I can without giving up quality. Tubular is designed and manufactured to a high quality level, not a low price point. Panasonic, Nichicon and TDK capacitors. Texas Instruments and Fairchild (On Semiconductor) chips and transistors. Rugged construction to meet the needs of gigging and touring professionals. Point-to-point wiring to main circuit board and all through-hole construction. Increases reliability. Removeable and replaceable tough, durable neoprene rubber pad on bottom of case. If you want to put Tubular into a pedalboard, you can peel off the pad and use velcro to attach the pedal to the pedalboard. You can later return it to stand-alone use by replacing the rubber pad. No harm done, and Tubular will be returned to its original condition. 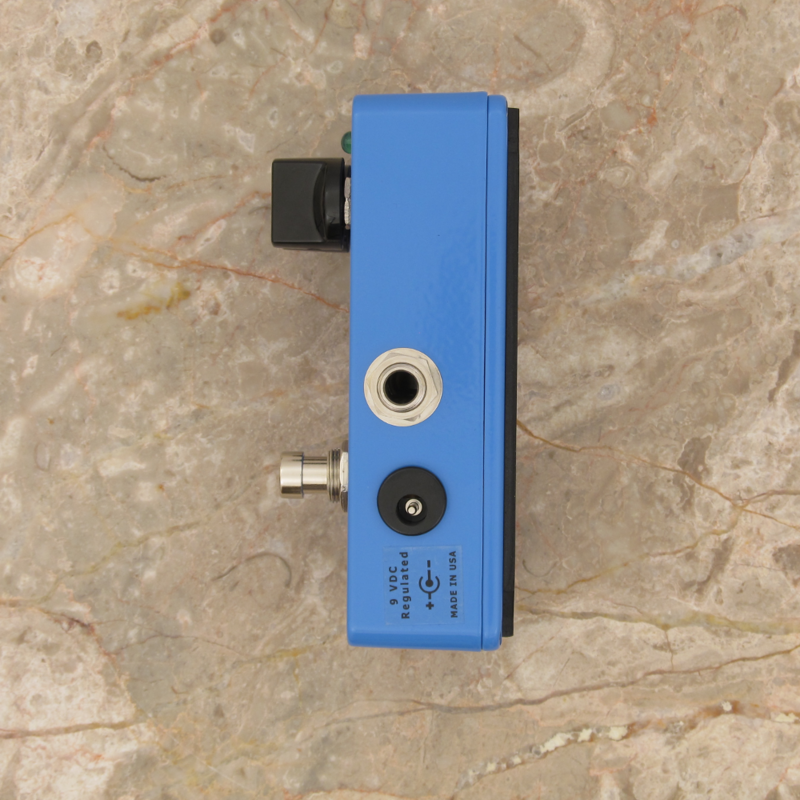 Vintage/Modern design that uses FETs for desireable vacuum-tube-like harmonics along with modern opamps to avoid undesireable kinds of distortions or other sonic faults. Frequency response: 20 Hz to over 40 KHz. For use with any kind of electronic or electric instrument - bass, synth, electric piano, etc. It's not just for guitar! The audio quality is hi-def ready, and is good for 24/96 or 24/192 recordings. Input level: Nominal -10 dBV (0.4 volts peak signal amplitude). That is what an average electric guitar produces. To use Tubular with a keyboard synthesizer, turn the Drive control on Tubular all the way up (clockwise), then use the output level on the synth or other device to control the drive. If your instrument has an unusually high output level, turn the Tubular's Drive control down as needed. Modular synths typically have much higher internal signal levels, and you will need to take the output from a module specifically designed to drive outboard devices such as mixers, and use the directions for line level instruments below. To use Tubular with a microphone, you will need to amplify the level of the microphone to get it up to about -10 dBV. Use a microphone preamp, with less amplification than you would normally use to feed a mixer or whatever you usually use your microphone with. To use Tubular with a line level instrument or effect, turn the Drive control on Tubular all the way down (counterclockwise), then use the output level on the other device to control the drive. Internally surge protected to protect the sensitive semiconductors from voltage spikes coming in through the power or audio input jacks. Powered from a 9-volt alkaline battery or power adapter. A power adapter is recommended. Current consumption is about 15 mA. Powder-coated Hammond 1590B case. I do the powder coating myself to make sure it's done right. The coating is thick and durable. It took many years of development to evolve the circuit used in Tubular. At first, I needed to learn a lot about designing circuits with FETs so I could use them to get the basic "tubular sound" I wanted. I tried many circuit configurations and models of transistors. I spent countless hours trying each circuit until I could hear and compare their harmonic differences and choose the best. Eventually, I got to a point where I realized I could make FETs sound almost exactly like the 12ax7 vacuum tubes that are commonly used in guitar amplifiers. I spent a lot of time developing that type of circuit with intent to make it into a product, but during months of testing and evaluation, I reconsidered and decided it wasn't good enough! I came up with more ideas for circuits to try out that were variations on the same theme, and eventually developed the Tubular circuit using a kind of "hybrid" method that mixes high fidelity opamps with "vintage" preamplifier design. The result is a circuit that sounds much better, allows a wider variety of applications, and would have been far too complicated and impractical to be made with just vacuum tubes. 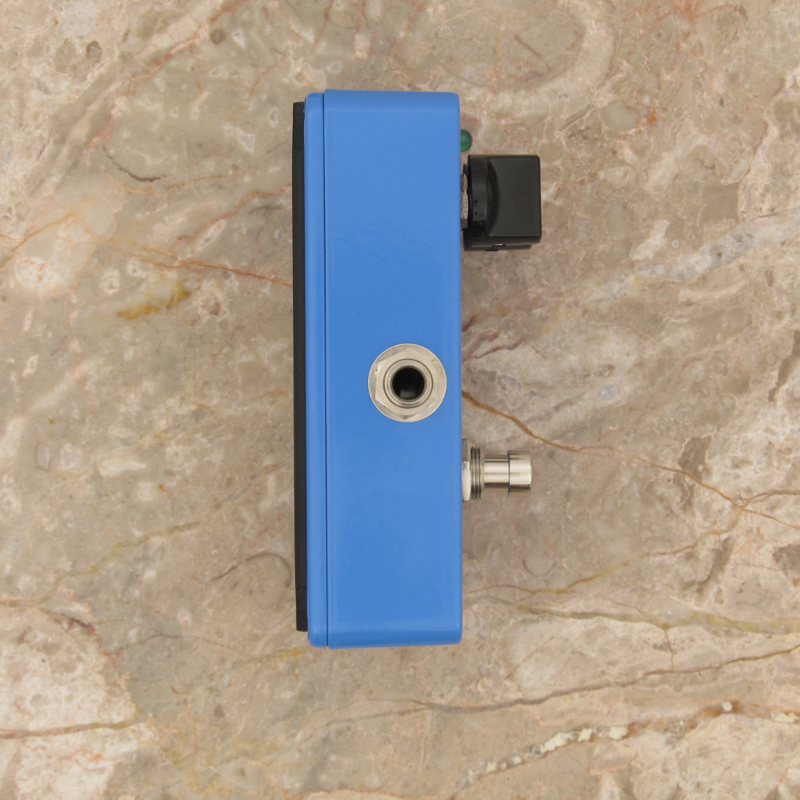 Yet it easily fits in an effect pedal form factor and runs off of a 9-volt power adapter, while costing far less than any decent-quality vacuum tube guitar amplifier. 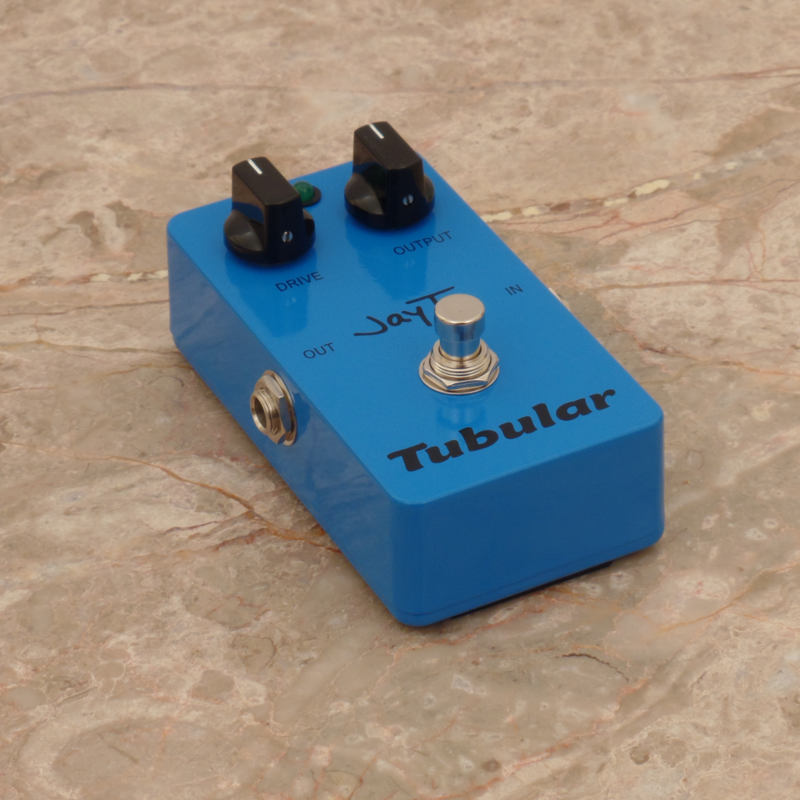 I tested pre-preduction units of Tubular over a two-year period, playing many kinds of music through them, and using them in different pedal chain configurations, along with many other kinds of effects, and could not find any way to improve the circuit. At that point, I felt confident Tubular was ready to sell as a product. There are more details about how I started designing Tubular on my About page.